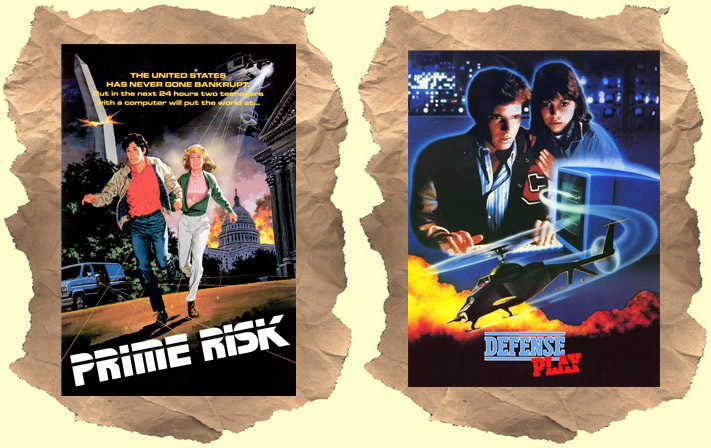 Prime Risk: Despite the usual cliche, and the poster art above showing a damsel led by the man, this film's hero is the girl. She's the smartest one in the room. A female counterpart to Matthew Broderick's hacker nerd in WarGames. Toni Hudson steals the show as a cute computer chick who figures out a way to hack ATM machines for free cash. She and her dopey boyfriend stumble onto a conspiracy plot by Keenan Wynn to screw up the US cash system. Comedy, thrills and action follows. A fun recommended sleeper. Defense Play: Low budget thrills with a professor developing a small remote controlled, drone like, helicopter. The Russians want to get their hands on it so they can screw up the US military's launch of a new satellite. They kill the professor but their espionage plans are delayed when a few of the teacher's students discover the plot. It's America teens vs Russians spies with of computer drama, 80's pop rock and some action scenes to fill the story. An impossibly young Jim Beaver (Deadwood, Breaking Bad) shows up near the end.